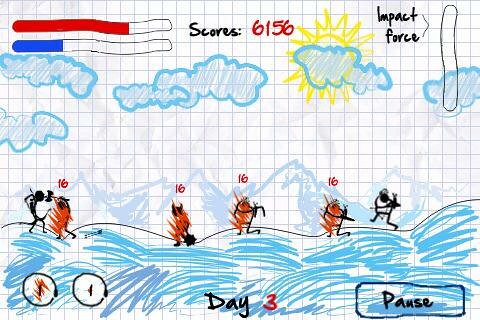 Alone At War is a hand-drawn game in which you play as a stickman fighting hoards of baddies. Though it sounds simple, it is not. You need to stay alive for as many days as possible fighting all these enemies and to do this you have a bow, some arrows and some cool magic to use. In my opinion, the game looks kinda.. ugly haha.. but after playing it for a while, you will be addicted and the cosmetics just does not matter anymore. Alone against all, you must defeat the vicious enemies attacking your kingdom with only your bow. Adjust the force and the direction of your arrows to inflict maximum damage. Battles are won a day at a time, and enemies will attack until the sun sets. As your hit count rises, you can obtain enhanced arrows and even spells to cast on your foes. 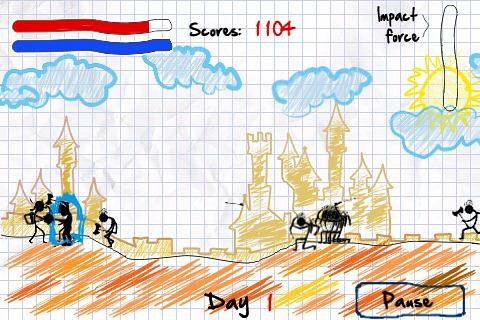 Simply drawn yet with a wealth of cool effects and levels, Alone At War is a superb way to kill time, and baddies!